Where do you find your inspiration? From the voices inside my head. They won’t shut up. What is your favourite aspect of Talisman Of El? Learning about the people of Arcadia. Who is your favourite character from Talisman Of El and why? Charlie. He defines humanity in all its perfection and flaws. What are you working on now? The sequel to Talisman Of El. What do you love most about writing? Exploring new realities and stepping into someone else’s shoes. 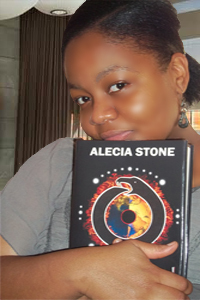 Alecia Stone loves all things supernatural. The scarier the better. She started writing her debut novel, Talisman Of El, in 2008. Alecia’s young adult fantasy novel features a wonderful blend of magic, mythology, and adventure. She holds a degree in Film and TV from Brunel University in London. Alecia currently lives in England, UK with her family. This entry was posted in Events, May 2012 - Indie Author Event and tagged alecia stone, author bio, buying links, interview, talisman of el, website, YA. Bookmark the permalink.